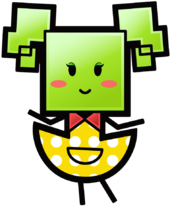 Mimi is one of the main villains in the game Super Paper Mario and a minion of Count Bleck. She has a violent and cruel temper and uses her appearance as a cute and innocent girl to lure travelers into becoming slaves. She possesses the ability to shape-shift, often taking the disguises of Merlee and other characters, hence her name, that is derived from the word "mimic". According to the InterNed, Mimi's theme is called "Mimi the Copycat", her first battle theme is called "Mimi Battle" and her second and third battle theme "I'm Not Nice". Her true form is that of an evil-looking robotic spider, seen during most of the battles against her. Whenever Mimi is in her true form, her dialogue box is in a shade of purple with white text color, similar to the Shadow Queen and Bonetail in Paper Mario: The Thousand-Year Door. Mimi first appears in the game Super Paper Mario during the meeting of Count Bleck's minions which occurs after Mario enters the door to Chapter 1. However, her actual form is not seen in this cutscene, as she uses her transformative abilities to appear like various different characters. She first takes upon O'Chunks's form and, due to this being the introduction to the villains, she seems like she really is the bulky minion, until the real O'Chunks pops in. Then, she takes upon Count Bleck's form to scold O'Chunks, Princess Peach's form to accept the Count's compliment on her shape-shifting, then Bowser's form to yell at Dimentio for reading her diary (a reference to the first Paper Mario). Mimi dresses in a maid uniform. Mario and Peach first encounter Mimi in her girl form when they reach Merlee's Mansion in Chapter 2-2. Unbeknown to the heroes, Mimi had been sent there by Count Bleck to defeat them before they can obtain the next Pure Heart, which Merlee has taken with her into hiding. Taking the disguise of Merlee's handmaid, Mimi makes her first attempt on Mario and Peach's lives when she tells them that Merlee is in the room above them. When the heroes enter the room, the door is covered by bars and the roof begins to lower. Mario and Peach escape the trap by flipping into 3-D, and continue their search for Merlee. He and Peach eventually release Merlee's pet, Gnaw, which chases Mimi away. In Chapter 2-3, Mimi orders Mario and Peach to work off a debt of one million Rubees after they break a vase. Using their new Pixl friend, Slim, they discover a secret stash of Rubees, allowing them to pay off the debt. This causes Mimi to go into a shock, saying it was "impossible" to earn one million Rubees and claiming the "wonderful curse" she put on the mansion was broken. She then flees by appearing to explode. Mimi yelling at Mario for breaking a vase. In the last part of Chapter 2, Mimi impersonates Merlee and asks Mario and Peach to sign a contract to pay off 10 million Rubees for the Pure Heart. However, a hologram of the real Merlee warns the heroes that it was a fake. Mimi gets angry and morphs into her Rubee-shooting true spider form, which is impervious to attacks at this point (Which is similar to Tubba Blubba being impervious for not having his heart with him). She chases Mario, Peach and the Pixls around the mansion's basement, spawning at their location whenever they take too long to move on from a room. After a long and grueling chase, Mario and Peach find a bathroom at the bottom of the basement where Merlee is hiding with the Pure Heart. Mimi then appears and in a flash of light she transforms into Merlee. To decide which Merlee is the real one, a contest is held where Mario must ask each of the Merlees five questions to decide which one is the real Merlee. Regardless of whether or not the heroes choose correctly, Mimi attacks Mario and Peach, but Merlee removes her invincibility with cheer-leader-like chants. It is noted that Spider Mimi's legs fall off after taking enough hits. She is then defeated by Mario and Peach and flees the mansion. Mimi is fought again in Chapter 6. Posing as King Sammer, she tells Mario, Peach and Bowser that the Pure Heart is in the chest beside them. When opening the Treasure Chest, the heroes finds a bomb, and, when they aren't fazed by the explosion that erupts from it, Mimi attacks him, this time in her girl form, to waste the rapidly declining time before Sammer's Kingdom is destroyed by The Void. Although she loses in the battle, she succeeds in her goal as Sammer's Kingdom is destroyed shortly afterward. In Chapter 8, Mimi poses as Merlon and tells the heroes to hit a "totally unsuspicious" ! Block. When struck, it causes Mario and Co. to fall into a pit. She then disguises herself as Merlee once again, and asks three questions the heroes on what they're afraid of; she places the items or enemies in a corridor up ahead, and when the heroes survive, she gets upset and insults Peach. While Mario and Luigi continue on through the castle, Peach and Mimi have a one-on-one battle, ending in Mimi's defeat just as the room begins to fall apart. Mimi almost falls into a hole in the ground, and even though Peach grabs her by the leg in an attempt to save her, the girl is too heavy for the princess and they both fall into the trench. Mimi is revealed to survive when she and O'Chunks come to Count Bleck's aid after Dimentio takes over. She warps herself and O'Chunks to Dimension D to help the Count. Mimi and O'Chunks' love for Count Bleck helped Mario, Peach, and Bowser defeat Super Dimentio. This action redeems Mimi. Mimi and her spider transformation sequence in the Super Mario-Kun. After the game is beaten, she gets a job working as Merlee's actual maid, and, since Merlee rarely uses her mansion (as she had moved to Flopside far earlier in the game), she decided to turn Merlee's mansion into a stable of cutie-pies (otherwise known as boys). One of Mimi's former slaves says Mimi is making him pay for the time he spent in the mansion while she was away, he however is delighted at this because he now has something to do. To help raise money for her stable, she begins the creation of a Cutie-Pie Video Game and a Cutie-Pie Cafe. In volume 37 of the Super Mario-Kun, Mimi appears, and her role is akin to her appearance to the game the story arc is based on. She is first seen with a crude sketch of Mario on her face, and then she ties Merlee up, and then disguises herself as Merlee. The fake Merlee then leads Mario to a trap, where Mimi then transforms into her spider form. A Gnip then gives Mario a ? Block, which releases many mini 8 bit Marios that help Mario defeat Mimi's spider form. Mimi gives a lot of information about herself in the game show "That's My Merlee!". Whether it is true or not is debatable, as she was disguised as Merlee at the time and may have been attempting at making Mario and friends think that she was the charmer. However, it is very likely to be true as Mimi has stated before that she likes men and also states it in the show. Also, when asked what her favorite animal is, she replies "an adorable little demon", a demon being her favorite animal would match Mimi's personality. Her birthday is May 5. Her childhood nickname was the "Odd Porpoise". She likes to watch reruns of Super Ultra Goomba Bros.. Her favorite smell is Old Cheese. Her favorite food is tangerines. Her favorite animal is a demon. Her best feature is her effervescent personality. Other aspects of Mimi's personality are revealed throughout the game, such as how she hates the dark. She also enjoys fashion, and is the one of the only characters in Super Paper Mario to change their outfits. Mimi wrote in her diary that her dream of a perfect world is a gem-filled pool with hunky lifeguards (as revealed by Dimentio); this is one of the many times Mimi is shown to have a love for gems (especially Rubees) and boys. Mimi in her spider form. Mimi has a large number of powers. The most notable are Mimi's shape shifting ability and the invincibility that Count Bleck gave her. She has numerous powers that involve her beloved Rubees and can also transform into a spider-like form. First her head turns upwards to the right, then it swings back (whilst emitting a number of loud cracks). After which, it starts spinning almost uncontrollably with her eyes large and round. It stops upside down. In the first fight, her bow loses color and the lines unfold into a pair of her legs. Her eyes and arms stretch out into the other two pairs after a casino-esque jackpot noise. When in her spider form she can shoot Rubees at the heroes; she can also tuck in her legs and fly around the room with pointed Rubees sticking out of her, as well as cause a wave of Rubees to come out of the ground, dealing damage to anything it touches. When in her girl form, she can form a barrier of Rubees around her and create Rubees out of nowhere. Like Mario and Dimentio, Mimi is gifted with the ability to flip to 3-D. Mimi can also float in the air, fly and warp to different locations. Mimi's true identity is shrouded in mystery. There are two theories, according to Carson, that may explain who Mimi really is: a failed Pixl created by the Ancients, or the unintended result of a witch's experimentation with shape-shifting potions. A third theory could be her True Form. If Mario flips into 3D, the player can see gears from inside Mimi's spider form, implying that Mimi may be a robot altogether. This could be supported also by the fact that she apparently explodes into pieces in Chapter 2-3, but survives. Another explanation for her explosion in 2-3 is that she was still invincible in 2-3, so she survived. Please see here for a full list of quotes. "I'm Lady Merlee's handmaid. My name's Mimi!" "But you can call me Mimikins if you want!" "Coins?! No one uses COINS anymore, you peasants! I SPIT on your coins!" "I guess I'll congratulate you... by tearing you into little bits like stupid confetti!" "Nighty-night! It's bedtime for you guys!" "I like getting what I want, so I do whatever I need to get it." Card Description It's Mimi, the adorable, yet slightly unstable shape-shifter! Word is, she has a crush on Count Bleck. Manēra Come from "mane" (真似, "copy"). French Mimic The English word "mimic." Meoni From "money", referring to her fondness of Rubees; may contain 거미 ("geomi"), meaning "spider", which refers to her spider-like true form. Mimi is the only one of Count Bleck's main minions who also serves as a Chapter boss. Mimi is a rather prominent homage to the 1982 science fiction horror film The Thing. The film's main antagonist is an extraterrestrial organism capable of shapeshifting, and one of its most notable appearances in the film is as a grotesque, upside-down face on several spider-like legs; save for the alien origin, the creature's traits are prominently featured in Mimi's character. This page was last edited on November 13, 2018, at 22:39.